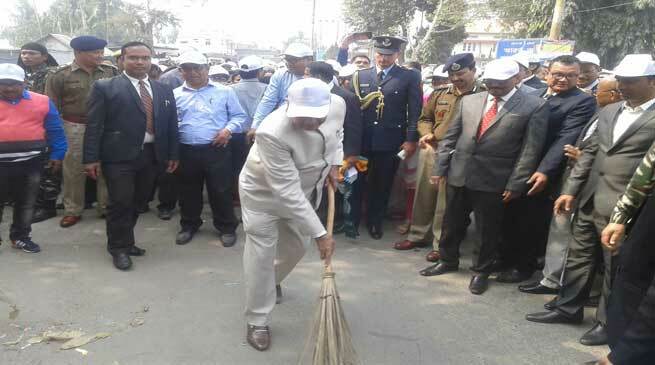 On the second day of his visit to Kokrajhar, Assam Governor Banwarilal Purohit today participated in the swachh Bharat Abhiyan, the exercise undertaken by the Kokrajhar district administration on Bibekananda path at circuit house area. Addressing the participants, he said that with the support of the people the messages of cleanliness have reached every nook and corner of the country. The Governor appealed to the citizens including women and students to actively participate in the endeavour of Swachh Bharat Mission and undertake responsibility of cleanliness of public places, own dwellings, work places, surroundings, localities, towns, and villages as to protect ourselves from any diseases as well as to make India a clean country. He also called upon the Kokrajhar Municipality Board and the residents of the town to keep their town always clean and try to earn rewards for this in the state and national levels. In his speech, he also urged the BTC authority to develop the tourism sector in the area as to attract tourists from outside as it has tremendous scope in this direction as per its geographical location. BTC Principal Secretary Biren Chandra Phukan, BTAD IGP LR Bishnoi, Kokrajhar DC Bibekananda Choudhury, SP Rajen Singh, officers of district administration, volunteers of SBM and more than hindred of citizens joined the Governor with full enthusiasm in the drive. Earlier, the Governor was welcomed and felicitated by the Kokrajhar Municipality Board, Kokrajhar Development Authority and heads of educational institutions.